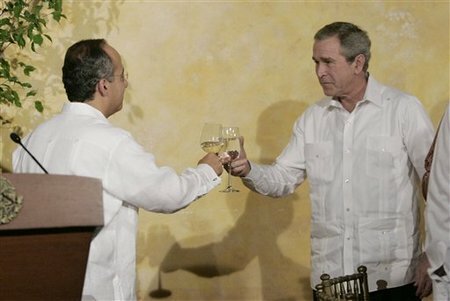 President Calderon, I appreciate your determination to create new opportunities for the people of Mexico. I share your commitment to building an Americas where the poor and the marginalized begin to feel the blessings of liberty in their daily lives. I respect your views on migration. Because we're working together, I believe we will make good progress on this important issue. Together, we're working to ensure that we have a secure and modern border that speeds the legitimate flow of people and commerce, and stop those who threaten our common safety and prosperity. The first paragraph is important because it shows that he said the second paragraph in English. Thus, he used the word "migration", which is one of the Mexican government's euphemisms for "massive illegal immigration to the U.S." And, while we definitely are part of a region called North America, I don't recall a vote on how close we want to get to our neighbors; Bush is promising to help build "an Americas" which is almost certainly beyond good neighbors made by good fences (so to speak). And, the choice of "safety and prosperity" is eerily similar to the "Security and Prosperity Partnership of North America". The United States respects rule of law. But in the debate on migration, I remind my fellow citizens that family values do not stop at the Rio Grande River, that there are decent, hardworking honorable citizens of Mexico who want to make a living for their families. And so, Mr. President, my pledge to you and your government -- but, more importantly, the people of Mexico -- is I will work as hard as I possibly can to pass comprehensive immigration reform. He's pledging something that the great majority of Americans would never support if they knew everything involved. Instead of making promises to foreign leaders, he should remember who he's supposed to be working for. Today, the most important ties between the United States and Mexico are not government to government, they are people to people. These ties include churches and faith-based institutions that serve people on both sides of the frontera. What, collaborateurs like Humane Borders? The Catholic Church? Aren't even the "people to people" ties extremely problematic, in that they retard assimilation and encourage people to think of themselves as belonging to two countries? We'd all be better off if Bush just stayed in Mexico. And, no, I'm not joking. UPDATE: I added the picture from their dinner. Note the guayabera. Why Mexico first; no loyalty is owed to them ahead of citizens? Stunning. First, he waits three years, until the war is almost lost, to change leadership; now he is going to stick to his guns on illegal immigration until he has destroyed the idea of American sovereignty. It looks also like he's in most unseemly haste to make new promises to dirty Mexico, just in case anyone thought that those made to Fox might have expired. If the people knew about this, Bush's approval would be in single digits, and it's hard to believe that the White House doesn't realize that. Not even 2% of Americans could want an anschluss with the bribe-land to the south. Only the one-worlder Bush family and some malicious leftists and some really dirty businesses could want that. "I will work with Congress, members of both political parties, to pass immigration law that will enable us to respect the rule of law - and at the same time, respect humanity," Bush said in a news conference with Mexican President Felipe Calderon. In other words, I'll take the only thing I care about--guest worker--and you can count on me to 'respect humanity' by not doing any enforcement. The temporary guest worker advocates like Bush, McCain, Kennedy, Pence, Hagel, Martinez, Cornyn, and Kyl are the least honest players in this debate and need to be exposed on this issue at every opportunity. Even Tamar Jacoby admits there's nothing more permanent than a temporary worker. The temporary claim is simply fraudulent, an attempt to fool the majority of people who all studies show do not want dramatic increases in permanent residents. Second, I don't hear Bush talking at all about the sickening abuses inherent in the current guest worker program. From NYT's Bob Herbert's 'Indentured Servants In America' column: Â“This is not a situation where there are just a few bad-apple employers,Â” said Mary Bauer, director of the Immigrant Justice Project at the Southern Poverty Law Center, which has initiated a number of lawsuits on behalf of abused workers. Â“Our experience is that itÂ’s the very structure of the program that lends itself to abuse.Â” Bush, by all indications, just wants more of the same. So it's simple, really. These guest worker advocates are trying to hoodwink us Americans and have no problem with treating foreign nationals who want to come here like garbage. And these are the same guys who sanctimoniously throw the words 'humanity' and 'dignity' around? Gag me with a spoon!